The namesake to Utah’s capital city, the Great Salt Lake is really a sort of “closed sea.” But for the past few years the Great Salt Lake has really existed as two separate bodies of water, the north arm, and the south arm. They’re divided by the rock filled railroad causeway that I’m driving down, watching the sun begin to fade into the west desert. Built in 1959, the causeway was designed to allow flow through two 15-foot wide culverts near the middle of the lake, that have since been closed due to structural concerns. A 290-foot wide breach was installed in the mid-80s, but as David Tarboton, professor of civil and environmental engineering at Utah State University explains, there’s a problem. “The level has dropped to where water no longer flows over the breech, so the only exchange of water between the two parts of the lake is seepage through the causeway, and that’s not a lot,” Tarboton says. Sarah Null, a professor in watershed sciences at USU recently co-authored a study on the causeway with Tarboton. She says the years of separation have caused the lake’s north and south arm to exhibit observable differences. 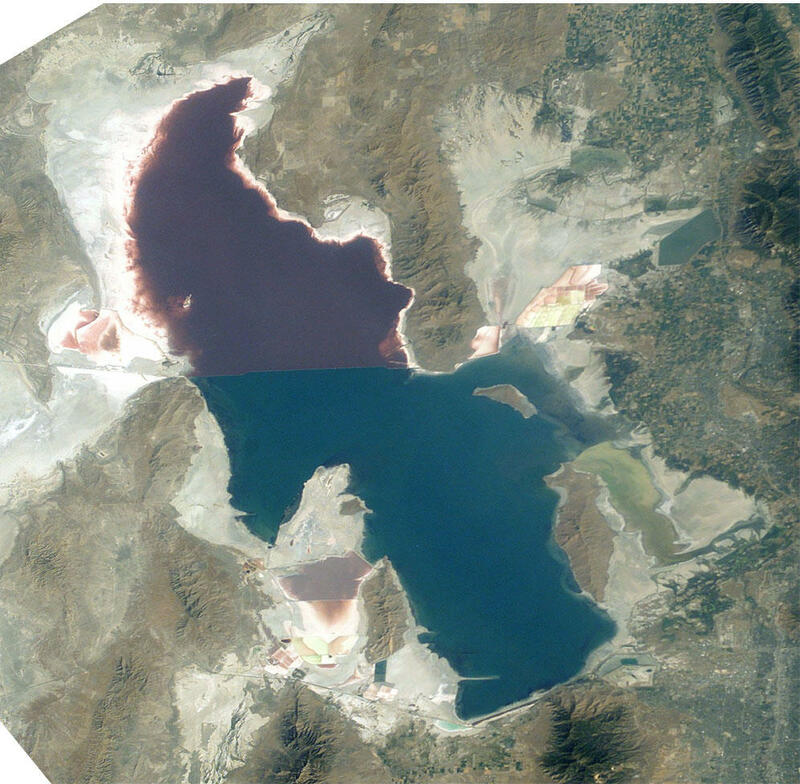 The visible color difference between the north and south arm of the Great Salt Lake, as observed by a NASA satellite. This is concerning for two reason, “the big E's,” Ecology and Economy, and they both center partially around Brine shrimp . The north arm is too salty for these crustaceans thrive in, and sometimes the south arm is too fresh to support the $57 million industry. Also affected by salinity is mineral extraction operations on the lake. Both of these industries combined generate $1.3 billion dollars in revenue. “You know nationally you probably wouldn’t notice it, but for Utah it’s an important local source of revenue. So if nothing happens, the north arm would basically reach saturation or close to it most years and most times of the year, and then the south arm would become fresher, especially in wet years. So there might be fewer places that are appropriate salinity to support the ecosystem,” Null says. Union Pacific Railroad, who operates the causeway, proposed different bridge designs when the culverts were closed in 2013, but by summer of 2015 no construction had begun and no design had been decided upon. So together Null, Tarboton, and graduate student and lead author on the study, James White, compared the possible bridge models to determine their effect on salinity and lake levels. “All of the bridge designs are kind of trapezoidal openings, and you put those in an all of sudden water would be able to flow back and forth. We found is that out of the four bridge designs the largest would be most like natural conditions. It would allow the most mixing between the north and the south arm,” Null says. While the study suggested that the 180-footwide bridge was the best option to revert to original flow conditions, it also pointed out that the alteration of salinity in both arms would be a boon for some industries and a bust for others. “There is an optimum range is believed to hold for the brine shrimp to be sort of best, and obviously the brine shrimp harvesters want the lake to be in that range,” Tarboton says. Mineral extractors in the north may lose out with lower salinity levels while those in the south would benefit, and in the south brine shrimp collection would be in its prime with higher water levels, but if the water becomes too saturated with salt in low level years the industry may suffer. Recently Union Pacific announced its plan for a bridge design that would allow for adaptive control of water flow depending on needs, but there is no end date for the project, so the future of the causeway and the lake divided remain unclear.